Centrifugal force separators are a proven method in the industry for dust separation through their simplicity of installation and safety during operation. 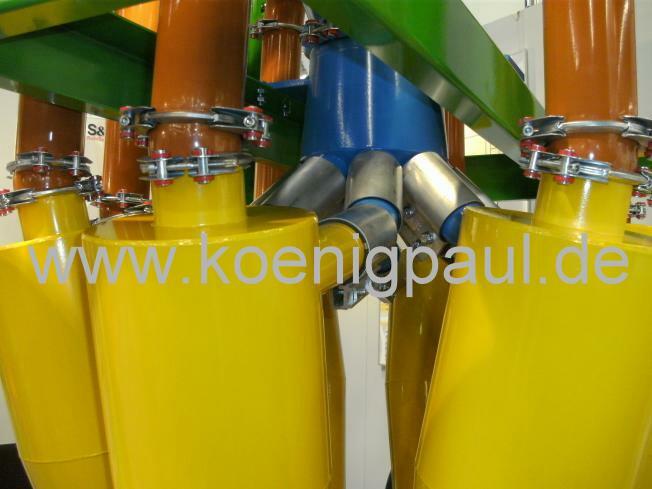 The gas cyclone is used primarily in the wood, plastic, cement industries, in pneumatic transport systems, in the chemical industry as well as the food industry. The particle contained gas movement in the cyclone is transformed into a rotational flow as it travels through the cyclone. As a result the material particles are in a centrifugal force and push the particles towards the outside radius. The material particles are then separated from the gas flow. 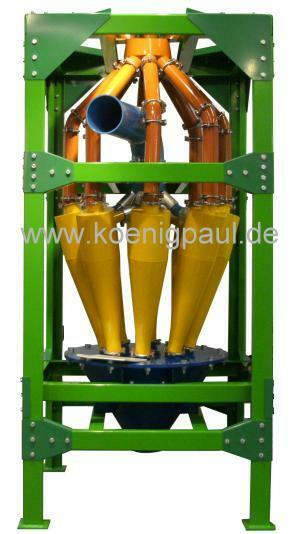 Cyclones are used for both solid and flowing material particles. Gases would tangentially enter various geometric inlets through a cylindrical container with a conical lower area. Through an accelerating tumble effect flow, the material begins to sedimate caused by the centrifugal force toward the outer wall of the separator and travels in a spiral form along the conical surface in a downward direction to the dust collection container. Larger cyclones are necessary relative to a greater air volume. Smaller cyclones are by far more efficient for precise particle separation then larger cyclones. Ing. Büro Paul König has developed the multi-cyclone program. Other types of multi-cyclone systems on the market do not achieve precise flow characteristics. Our multi-cyclone system is engineered and designed to ensure precision flow characteristics and material particle separation. The individual cyclones are calculated through the assistance of our computer program. Including precision flow design for inlet and exhaust collector. Consistent flow velocity in the pipework. Additionally a rotary valve or dust collector bin can be installed on the material discharge outlet. Degree of separation for small particles, for example, for 2000 m³/h with a single cyclone DN 800mm compared to 8 cyclones DN200 approximately 20% higher. The sizes and dimensions could vary and as an example was demonstrated with 8 cyclones at 2000 m³/h. All variations with multi-cyclones are possible and can be fabricated. Feel free to contact us. If you have any questions or require our assistance, we will be glad to help you.